Use your voice for children! I did. This is a guest post from Paige Runion, Leadership Coach at 4C for Children. I have often reflected that I am a product of 4C for Children, the regional child care resource and referral agency in our region. I’ve grown from my early years of doing the wrong things for the right reasons, learned to become a reflective early childhood professional and, now, am pursuing my passion for early care and education as an employee of 4C. It has been quite a journey. And what I love is this: All along, I have been learning. My most recent lesson was in advocacy, through immersion. In the past, I have written a letter or two to express an opinion to a legislator. In 2006, I even sent an invitation to Steve Chabot to visit the Step Up To Quality star-rated child care center I administered (I was so surprised when he actually came.). But my more recent lesson in advocacy was the “in over your head, too far to swim back to shore” kind. A team from 4C was headed to Columbus to talk to our state legislators about the importance of children having access to quality early learning experiences. As I answered the email and accepted the invitation to go, I immediately considered backing out. The very thought of it shoved me into my own un-comfort zone. Would I feel like an outsider, or what Sallie Westheimer called “newish”? I stick my toes in the water slowly, and this was deep water. It felt risky, but I love to learn. 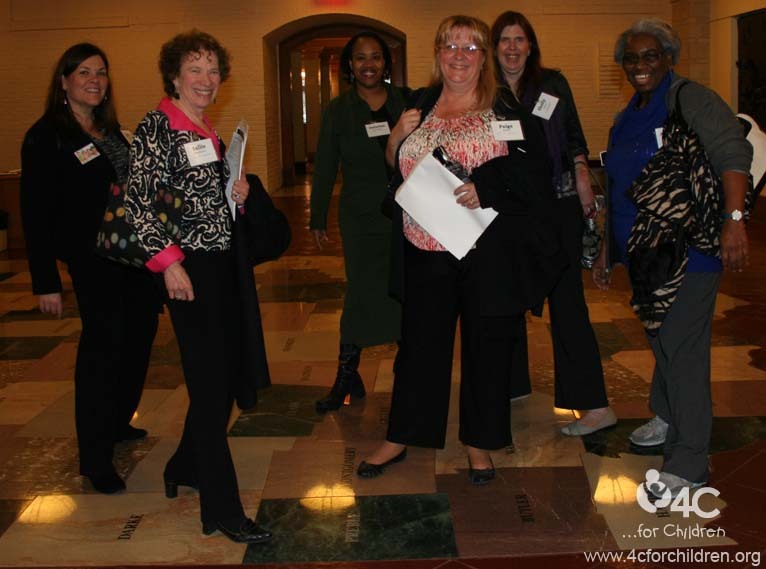 4C for Children staff who attended Advocacy Day 2014 in Columbus included (from left to right): Lorna, Sallie, Delorise, Paige, Shelley and Annetta. Here they are standing on a map of Ohio, covering all of the counties that 4C serves! Having the opportunity to see and participate in Ohio’s legislative process was a new experience for me. Government was not in my top 10 interests in high school, but it came alive as I walked through the halls of Ohio’s Statehouse and the offices of the Ohio General Assembly representatives and senators. Having the support of colleagues made each of us more comfortable. We watched Sallie Westheimer, our CEO, smoothly model introductions and we listened carefully to how she phrased her opening descriptions of the legislation we were there to discuss–a new bill not yet introduced. Soon our own stories sprang out of our mouths, however. Our passion for children and their families outweighed any hesitancy. And there we were, all learning again. We visited and spoke to aides in the offices of State Representatives Denise Driehaus, Timothy Derickson and Bill Coley as well as Senator Bill Seitz. We met with State Senator Eric Kearney. They learned of a bill coming to the floors of the House and Senate that will greatly help Ohio’s children who need it most. And we learned how to use the voice we have for children. And Sallie? What did she learn? Well, Sallie learned something about each of us. I quietly marveled at how gracefully she shared her skills with us and the importance of what we were doing. I continue to think of ways to take this experience back to other administrators, and I am considering some strategies to support them in beginning to understand the power of their individual voices. Will I return next year? Absolutely. And Sallie, I’ll not only go first, but you can give me a “newish” partner. I’m “oldish” now. And now I’m wondering what Capitol Hill looks like on the inside. This entry was posted in advocacy, Advocating for Children and tagged state legislature, state representative, state senator on March 19, 2014 by 4cforchildren.